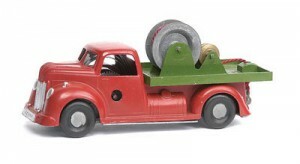 A relatively small die-casting company formed in 1946 by Charles Kempster and William Lowe – a combination of part of each surname producing the ’KEMLOW’ name – with the intention of producing die-cast miniature toys. Kemlow worked out of premises in Westbury Avenue, Wood Green, London producing a relatively small range of models, both civilian and military, and were also involved in producing and distributing die-cast models under the ‘Master-Models’ and Wardie Products’ labels. Kemlow produced both a stand alone armoured car plus a combination of armoured car with field gun. Both items came in either unpainted bare metal finish or light green and black camouflage finish. The bare metal model was fitted with smooth brass hubs, whilst the camouflaged model had similar painted hubs. Kemlow Guy delivery van in ‘Pickfords’ livery. Model in dark blue colourway finish with white roof. 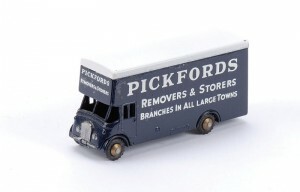 ‘Pickfords’ transfer decals to both sides, cab-over front panel and rear doors. Vehicle fitted with smooth brass hubs with black tyres. The streamlined saloon car and caravan came as either seperate models in their own right or as part of the ‘Fleetmaster Saloon Car Set’. The saloon car was loosely based on the American Chevrolet saloon and came in either all blue or all green colourway finish, the metal wheels finished in the same colour as the bodywork. The streamlined caravan came in cream finish, shaped window to both sides and rear, windows cut out to represent tied-back curtained windows. Bare metal wheels are covered by caravan sides. 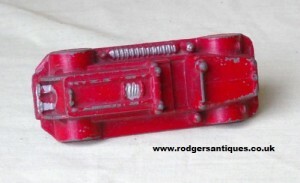 The road roller came in either predominantly red or green bodywork finish with a gold engine cover. All bare metal front roller, the rear roller sides usually painted in pale blue. A rather crude figure of a driver cast-in. 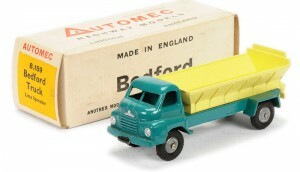 Kemlow also went on to produce a boxed ‘Dinky Toys’ size range of diecast vehicles under their own Kemlow name or alternatively marketed under the ‘Automec’ brand name. These vehicles were better detailed than previous and were fitted with rubber tyres. Interestingly some of the Automec vehicles were also produced in kit form for the purchaser to build it themselves. Initially plain card boxes were used with the model type printed to end flap. The Automec name printed to box sides with ‘Highway Models’ underneath. Later card boxes were coloured and carried basic coloured lorry drawings to the sides with the generic model type it housed being printed in large letters to the box sides. Again this was a case of one box suits all, the actual model enclosed within the box being identified on the box end flaps. A small scale range of military vehicles were produced by Kemlow to compete with the ‘Matchbox’ range, these were marketed under the brand name ‘Sentry Box Series’ although neither the box nor the model actually carried the Kemlow name. Each model came housed in a card box in the form of a sentry box complete with a picture of guardsman to its side and like the early ‘matchbox’ models the Sentry Box Series models all came with grey metal wheels. Kemlow as a diecasting company is still trading today but no longer involved in the toy business. The short lived British toy company of Burnett Ltd. was founded by F. Burnett and E. Satchwell in 1914 and were based at 53a Aldersgate Street, London EC1. 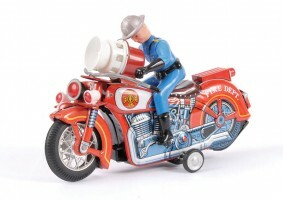 Burnett produced a variety of tinplate toys, various motor vehicles – cars, trucks and emergency vehicles as well as aircraft and locomotives. 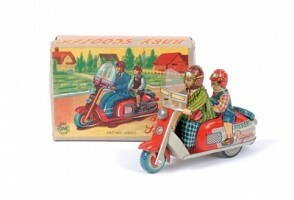 They were probably most famous for their ‘Ubilda’ series of tinplate construction kits. They were a listed exhibitor at both the 1922 and 1929 British Industries Fairs held at the White City. In 1922 they were given as manufacturers of metal mechanical toys (such as Motor Cars, Lorries, Omnibuses), Metal Money Boxes in fancy designs, Decorated Metalware (Tea Trays, Firescreens) and occupied Stand No. F46. 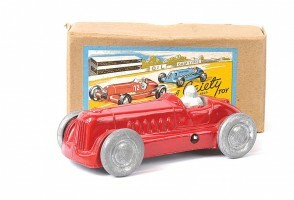 In 1929 Metal Toys (such as Cannons, Pistols), Constructional Toys (Ubilda Car, Aeroplane, Theatre), Toy Cash Boxes, Children’s Paint Boxes were added to the list, the company occupying Stand C24. Interesting to note that at the Industries Fairs they were listed as ‘Manufacturers’ of toys whereas it is often quoted that they produced nothing themselves and subcontracted manufacturing to Barringer, Wallis and Manners Co. of Mansfield. ‘Barringers’, as they were known locally, were later to become the Metal Box Co. and certainly produced a variety of tin money boxes etc. in their own right. 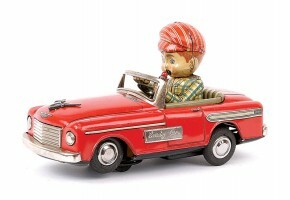 The company ran into financial difficulties and in 1939 their tooling was acquired by the Chad Valley Co. (see my separate listing) who continued to produce many of the Burnett vehicles as well as the ‘Ubilda’ range of toys. Other tenuous links to Barringer, Wallis and Manners and the Metal Box Co. was that in 1949 Burnett Ltd. was voluntarily wound up and amalgamated with the Metal Box Company. Also items like the Chad Valley ‘Carrs’ biscuit tin bus were in fact manufactured by Barringer, Wallis and Manners. 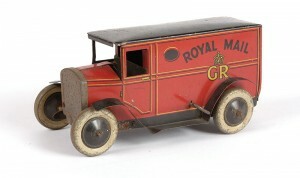 Scarce pre-war tinplate Royal Mail van. Van is predominantly red with black roof and wings. Clockwork in operation, fitted with permanent key, 15cm long. 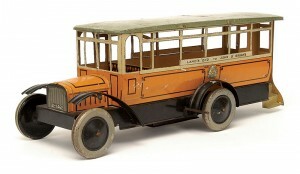 Scarce pre-war, c1920, large scale tinplate bus. Clockwork in operation, fitted with a permanent key, motor driving rear wheels. Model came in two colourway finishes, example shown is the harder to find deep yellow version, alternative is the more common red colourway finish. In both cases cream finish to upper bodywork with black chassis and wings. ‘Lands End to John O’Groats’ to side destination boards. Burnett circular logo to both sides. Interior bench seating with steps to the rear for boarding purposes. Fitted with tinplate balloon type wheels. O/all length 36cm. 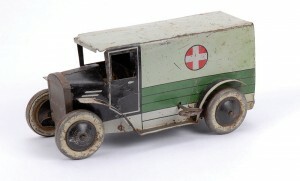 Another scarce Burnett model, this example dating to c1930 is of a tinplate, clockwork driven Military Ambulance. Predominantly grey bodywork colourway finish with green lower ‘plank’ effect. Black cab portion with grey radiator, black wings/running boards edged white. Ambulance roundals to the sides. Tinplate wheels with black hubs. Vehicle is fitted with a permanent key. Length 16cm. 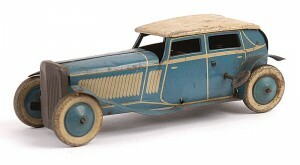 Pre war tinplate clockwork Sedan. Light blue bodywork finish and wings with cream detailing and cream roof. Fitted with balloon wheels and permanent key. Length 18cm. o/all. 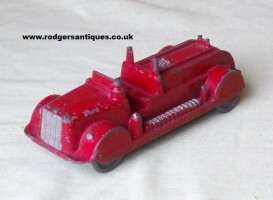 Pre war tinplate Fordson Tipper Truck with clockwork drive mechanism. Cab and bodywork in light green colourway finish with black chassis and large grey radiator to front of cab. Simple lever tipping mechanism to body with hinged tailgate. Grey balloon wheels with light green hubs. Permanent key 18cm. Burnett Open Tourer, blue bodywork finish with cream bonnet and detailing, large grey radiator. Black wings, running boards and rear hood. Fitted with maroon interior. Grey tin wheels with black hubs. 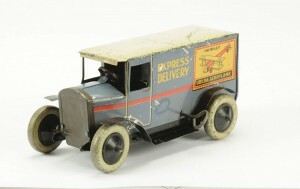 A scarce pre war example of a tinplate Express Delivery Van from Burnett. Grey bodywork finish with cream roof. Grey radiator to front, black wings and running boards. Grey tin wheels with black hubs. Clockwork drive motor fitted with permanent key. 16cm. This long established British toy company has its roots set in a stationery business set up by Joseph and Alfred Johnson (Johnson Bros.) in 1860 on George Street, in Birminghams’ city centre although its origins date back even further to a printing and book binding business set up by their father Anthony Bunn Johnson sometime around 1820. .a branch-line railway. This railway line brought raw materials to the site with most of the toys produced leaving by the same route. The firm now trading as Johnson Bros. (Harborne) Ltd., making stationers’ sundries and cardboard games and their new factory was known as The Chad Valley Works, named after the nearby stream. They later took the name of Chad Valley as their registered trademark and the building was to remain as the company headquarters for over seventy years. 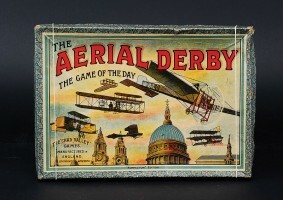 With the outbreak of the First World War in 1914 toys and games were no longer being imported giving a boost to the British toy industry and Johnson Bros. seized the opportunity, despite wartime restrictions, to expand its range of cardboard games and simple toys. A year later in 1915 the company was producing its first soft toys, a range of traditional plush Teddy Bears with jointed limbs and by 1916 it was to patent a machine for stuffing these soft toys. In these early days the companys aim was to complement the range of paper and card based products, which had been born out of their printing business, with more ambitious toys using different materials however a strong emphasis on the printed word remained and at a time when it was unusual for most ‘ordinary’ children to be given toys it was little wonder that output was targeted squarely towards affluent families with their well educated children. Such was the rate of the companys’ expansion since the early war years that in 1919 it was to acquire the nearby Harborne Village Institute which was used as their printing works producing box covers and labels for their toys and games. The companys’ soft toy production was relocated in 1920 to a new factory, the Wrekin Toy Works, at Wellington, Shropshire, where a new range of fabric dolls were introduced and all three factories were merged to become The Chad Valley Co. Ltd. In that same year both the Wellington and Harborne works were extended as business continued to increase. The soft toy range they produced all carried a sew-in label, well known by collectors of today, with most reading ‘Hygienic Toys / Made in England / Chad Valley Co. or Chad Valley Co. Ltd.’ some simply ‘Hygienic Toys England’. In 1922 Chad Valley was a Listed Exhibitor at the British Industries Fair (Stand F.35) Indoor Games, Puzzles, Christmas Crackers and Stockings, Toys of all Description including Playing Balls, Teddy Bears, Fabric Dolls and other Soft Toys, Rattles, Mascots etc. Interestingly enough they also featured (Stand Nos. K.35 and K.60) Listed as Manufacturers of Stationers’ Carded Sundries and Fancy Goods, Labels and Tickets, Office Appliances, Motorists’ Trunks, Fur Rugs and Gauntlets, Picnic Cases. 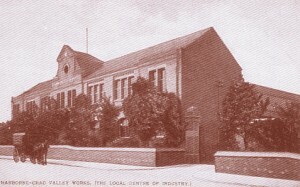 Further expansion took place again in 1928 with a new factory adjoining the main works at Harborne, and again in 1932 with the acquisition of the long established London toy making firm of Peacock & Company which added new capabilities and allowed them to offer tinplate products, including toy cars and clockwork train sets. During the 1920′s and 1930′s the Wrekin toy works produced a steady stream of new dolls, these dolls were dressed in authentic materials and Chad Valley even brought out several boy dolls suitably attired in tweed sports jackets with felt collars, neck ties and of course the obligatory gun bag as befits the children of the country squire. It was this attention to detail which set them apart from the competition but they were not cheap, typically selling for somewhere between 5/- and 30/- which would equate to around £20 – £100 in todays money. In 1938 Chad Valley were granted the prestigeous Royal Warrant of Appointment – ‘Toymakers to Her Majesty the Queen’, a relatively rare honour for a toy maker at this time. This may have had something to do with the fact that earlier in a bold move the Palace had been approached by Chad Valley executives for permission to produce dolls of the Royal Princesses, Elizabeth and Margaret Rose. It was with some surprise that the company received a note back from the Queen agreeing to the proposal along with suggested dates for the two princesses to sit for the proposed dolls. Fortunately for Chad Valley the dolls proved an instant hit, selling in large numbers not only at home but right across the then British Empire and so for the next fourteen years all Chad Valley toys carried the words ‘Toymakers to H.M. The Queen’. This was later amended to ‘Toymakers to H.M. Queen Elizabeth the Queen Mother’ when Princess Elizabeth acceded to the throne in 1952. Around the 1939-1940 period Chad Valley acquired the tooling of tinplate toymakers Burnett of London who had got into financial difficulties and continued to manufacture many of that companys product lines well after the second world war probably the most well know of which was the ‘Ubilda’ tinplate model kits. War, sadly again, played a part in the fortunes of the company in the 1940′s. The Second World War resulted in production of toys being dramatically cut as the Chad Valley factories concentrated their output to the war effort with government contracts for the production of such items as wooden instrument cases and cases for use in anti-aircraft guns, hospital tables and tent poles, auto-pilots and charts. However one factory was retained by the government for toy manufacture, specialising in the production of jigsaws, chess sets, draughts and dominoes for use in military hospitals and the Forces generally. 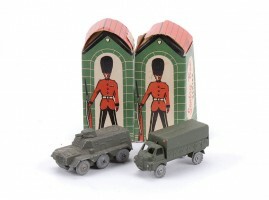 With the ending of the war the Chad Valley factories quickly returned to toy production and the company went from strength to strength adding both metal and rubber toys to their range. In 1950 it stopped being a family business and became a public limited company. Over the next ten years or so they go on to expand by acquiring several companies including in 1951 the metal toy manufacturers of Hall and Lane, in 1954 the family business of Robert Brothers (Gloucester) Ltd., trading as ‘Glevum’ Toys and in 1958 the metal toy makers Acme Stopper and Box Co. The Glevum range of toys and games were to be produced in Harborne at an additionally factory, the Wee-Kin Works, on the banks of the Chad. By 1960 Chad Valley comprised seven factories and employed over 1,000 people and was considered to be at its peak of manufacturing by this time. H.G. 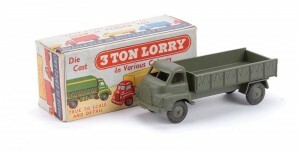 Stone and Co. Ltd. ( Chiltern Toys ) was the final company to be taken over in 1967 despite Chad Valley beginning to feel the onset of stiff foreign competition and recession. 1971 saw the company sold to John Bentley of Barclay Securities for £600,000 who came with the reputation of streamlining and rationalising companies under his control. Within a year the sales catalogue now lists only 250 products half of which were new lines whilst the remainder had been updated and repackaged. The main Harborne factory closes and was eventually demolished and boxed game production moves to the Hall & Lane factory site in central Birmingham. Three out of the nine factories are to close with the resultant redundancies. After 1975 only two factories remained whilst the manufacture of soft toys was relocated to Pontypool in South Wales. 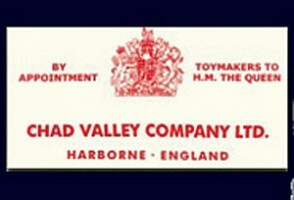 In 1978 the company was taken over by Palitoy of Leicester and a year later in 1979 the closure of the Hall & Lane site ended Chad Valley’s long established links with Birmingham. In 1988 the trade name of Chad Valley was acquired by Woolworths and remained in use until that company’s closure due to insolvency. Home Retail Group, the parent company of retailers Homebase and Argos, purchased the brand for a reputed £5 million in 2009. The Chad Valley brand is now available exclusively through Argos catalogues. An excellently illustrated Chad Valley boxed board game manufactured c1912. The object of the game was to move, by means of a spinning dice, around the board starting at London and finishing at Windsor Castle travelling via such places and cities as Dublin, Montreal, Paris, Japan and New Zealand. Board has lovely illustrations of the sights of London and other cities and counters are in the form of early Bleriot type aircraft. 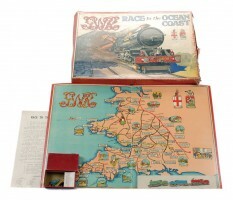 Dating to around the 1920′s is this Chad Valley GWR railway racing board game. An attractively illustrated board showing a map of Great Western railway tracks covering the West Country and Wales. Various metal locomotive and saloon car counters compete in this race to the coast. 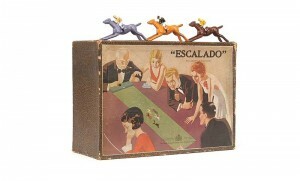 Without doubt the table top horse racing game of Escalado was one of those iconic games produced by Chad Valley. 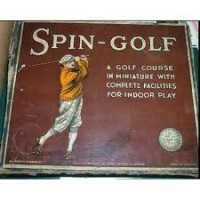 Introduced in 1928 the game was a constant best seller well into the 1960′s. Originally consisted of 5 lead race horses with jockeys, a green cloth fabric track with clamps and a mechanical winding mechanism along with a staking sheet on which one placed ones bets. Over the years the illustrated box top changed and reflected the decade, opposite shows a pre-war box lid. Originally dating to the late 1940′s this Chad Valley game is a complete miniature table top game of cricket. Contains a bat, ball, pair of stumps, scoreboard and numbers, 9 fielders and a firing action bowler. The bowler figure is used by one player to toss a wooden ball at the wickets whilst the other player attempts to hit the ball into play avoiding the wooden fielders. Shown here is an illustration of the 1950′s version of the game. Chad Valley ‘Wee-Kin’ motorised toy model of a Rolls Royce Razor Edge Saloon car. 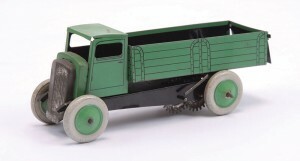 Diecast vehicle fitted with a key-wound clockwork motor produced between 1949-1953. Model came in various colouways in a card illustrated box at 1:43 scale. 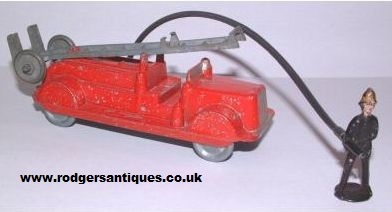 This Chad Valley clockwork driven toy comes as a cable laying vehicle, again produced around 1949 – 1953. Lorry came in red cab and chassis colourway finish with green bed mounted with a cable drum, coloured string acting as the cable. 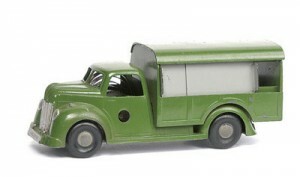 Wee-Kin van type refuse wagon, diecast clockwork model in van type configuration has green cab and body and fitted with grey tinplate sliding shutters. Again produced between 1949 – 1953. 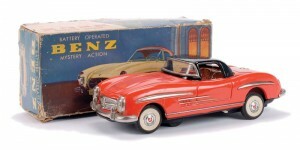 Note : The first Wee-Kin diecast toy vehicles were produced around 1949 and had ‘CV 1949′ as the registration number. I hope to cover the ‘Wee-Kin’ element of the Chad Valley range in more detail at a later date along with further images. 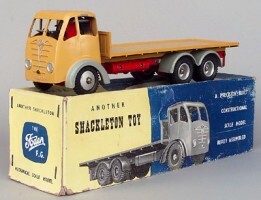 Formed by Maurice Shackleton in 1939 the company originally traded as James Shackleton & Sons Ltd producing a range of wooden toys such as dolls houses and lorries. The company was based at the ‘Wheatsheaf Works’, Malkins Bank, Sandbach, Cheshire and its original pre-war wooden lorries were of a simple design with a wooden chassis and body. 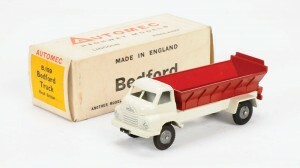 These toys were based on the Foden trucks of the day, its no coincidence as the Foden factory was just down the road and Maurice, prior to embarking on his toy making enterprise, actually worked there. The lorries carried a pressed metal radiator to the front of the cab and were also easily identifiable by means of their green Shackleton name badge which was applied to the rear of the cab. 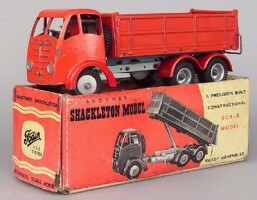 Although established as a manufacturer of wooden toys, today Shackleton are without doubt best known for their range of diecast models. Each model was manufactured using seperate parts which could in turn be taken apart and then reassembled by means of a basic tool kit. This tool kit simply consisted of a spanner and screwdriver and was included with each model. 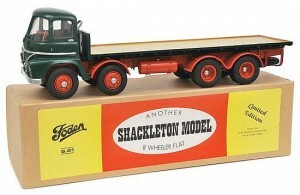 It was in 1948 that Shackleton launched this range of ready assembled diecast constructional models based on the Foden FG 6 wheel lorry. Each scale model came housed in a lift-off lidded card box. 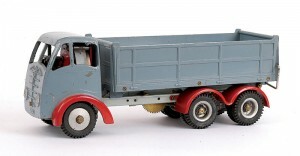 No one can doubt that the Foden diecast lorries produced by Shackleton were of high quality. 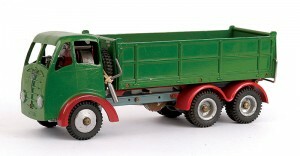 All the components required to build the lorries were made in-house and that included the clockwork motor. The motor was located inside the cab itself and power was transferred through a drive shaft to the vehicles rear wheels. The downside of all this attention to detail and the subsequent labour costs involved meant that the final price of the vehicle was not cheap, on the contrary the first boxed Fodens were retailing at a whopping £2/19s/6d (£2.97 1/2p) well outside the price range of the average schoolboy, at a time when the equivalent Dinky Supertoy Fodens of the day could be picked up at your local toy store for around 10/- (50p) ! 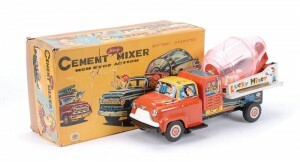 No doubt it was these high production costs together with other associated factors that resulted in the production of these high quality toys continuing for just four years before the company was forced to close its doors in 1952. 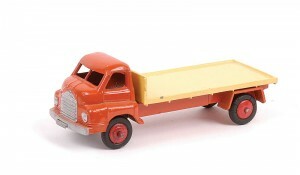 Model shown detailed in yellow cab and flatbed colourway on a red chassis with grey mudguards. Lights and radiator grille detailed in silver finish. Other colourway versions included : dark green cab/platform on grey chassis with red mudguards, light blue cab/platform on grey chassis with dark blue mudguards, yellow cab/platform on grey chassis with blue mudguards, dark blue cab/platform on grey chassis with red mudguards, light grey cab/platform on grey chassis with red mudguards, dark blue cab/platform on red chassis with black mudguards, dark blue cab/platform on red chassis with grey mudguards, yellow cab/platform on grey chassis with red mudguards, pale green cab/platform on grey chassis with red mudguards. The Shackleton 8 ton Dyson trailer could be used alongside any of the Shacklton Fodens. As with the Foden lorries the Dyson flatbed trailer came in a variety of colourways, the one shown opposite in dark blue flatbed finish with grey chassis and red mudguards with towing eye to the front. The thick card picture box came with two small end flaps and one large tuck-in flap to both ends. 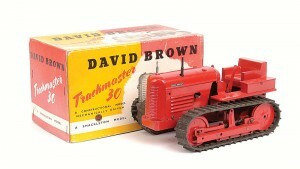 Like the Shackleton Foden models this ‘David Brown’ Trackmaster 30 came with a clockwork motor drive. Crawler tractor in red colourway finish ( I have only come across this colourway finish but that does not mean to say it was the only finish available ), with black rubber tracks and chimney. 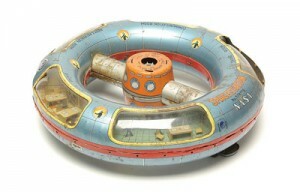 Model came complete within a picture card box with lift off lid. Above is a typical advertisement of the day for Shackleton Foden models which were placed in publications such as Meccano Mgazine etc. Interesting to note that the retailer must have placed the original advertisement as it is their name that appears with no mention of the manufacturer ! NOT QUITE THE END OF THE STORY ! In 1958 the Foden factory saw the introduction of lightweight glass-reinforced plastic (GRP) used in cab production. The first Foden GRP cab was the distinctly styled S21 model with its large split windscreen and bulbous front wheelarches. The S21 was initially nicknamed the ‘Spaceship’ or ‘Sputnik’ by the commercial press, but it is its other endearing nickname of ‘Mickey Mouse’ which seems to have outlasted them all. Not certain how the ‘Mickey Mouse’ name came about, the names that last tend to stick often come from the drivers of the vehicles themselves. Did they think that the S21 looked nothing like a conventional lorry ? or perhapse some wag though that head on it did resemble the cartoon character ? whatever it was the S21 which re-emerged as a ‘Shackleton’ model sometime in the 1990′s. 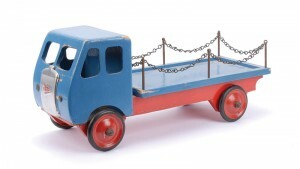 The S21 Mickey Mouse cabbed platform lorry was produced as a limited edition reproduction ‘Shackleton’ model in the late ’90′s by Frank Hardern using original tooling and dies. Produced in dark green colourway finish the model was produced with a resin cab, pressed steel chassis with a wooden platform body. Unlike the originals which were clockwork driven the S21 was powered by an electric motor turning through universal drive shafts to the rear bogie. The models came in a brown, lift-off lidded card box, with an applied printed paper label. The limited edition certificate, which came with each model, was in the form of a reproduction log book. Formed in Tokyo in 1959 Horikawa, often thought of as a manufacturer of tin toys, is now believed to have been simply a reseller of products supplied by Metal House (Marumiya) which itself began life around 1943. Horikawa is best known for its prolific range of space toys, noteably its space robots (Mr. Zerox, Attacking Martian, Fighting Robot) to name but three. Initially the robots Horikawa produced were clockwork in operation and are often referred to as their 1st. generation robots, later these were replaced by a ’2nd. generation’ which were battery driven. 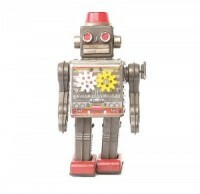 Depite three decades of success Horikawa, like many other Japanese toy companies of the time, closed in the late 1980′s whilst Metal House still continues to this date producing a range of battery operated tin robots. 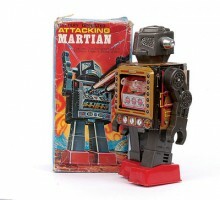 1970′s battery operated ‘Attacking Martian’ robot. Tinplate with plastic head, arms and legs, detailed tinprinting with open chest with firing guns. Walking action with moving arms, 23cm. 1960′s battery operated ‘Mr. Zerox’ robot. 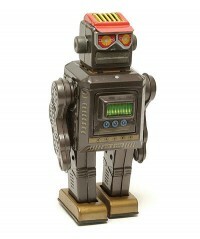 Tinplate with plastic head, arms and legs in dark brown colourway, red ‘baseball’ type hat and bronze feet. Walking action and moving arms, opening chest door reveals guns with firing and sparking action, 23cm. 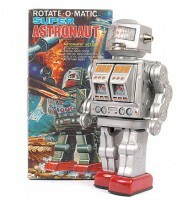 Battery operated ‘Rotate-O-Matic’ Super Astronaut Robot. Tinplate and plastic construction with opening chest with blinking and shooting guns with realistic noise. Automatic ‘Stop-N-Go’ walking action, moving arms and rotating body, 29cm. A 1970′s battery operated ‘Star Strider’ robot of tinplate construction with plastic arms and legs. Robot comes in green finish with lithographed detailing, opening chest feature with blinking and firing gun with realistic shooting sounds. Walking action, moving arms and rotating body, 30cm. Battery operated tinplate model of a ‘NASA Space Station’ dates to c1950, model came in blue finish with red trim with detailed tin-printing. 5x clear panels each showing a different ‘room’ within the station, control room / offices / dormitories etc., 29cm. Clockwork, permanent key, ‘Gear’ robot from Horikawa of tinplate and plastic construction in grey colourway finish with red feet. 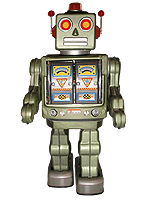 This 1960′s robot has forward walking motion with moving arms and space sounds. Clear plastic panel to chest with visible rotating gear mechanism. Red plastic sparking helmet, 23cm. Founded in 1951 the Mansei Toy Company, which often used the trademark ‘HAJI’ lettering within an oval, was a relatively small Japanese toy maker, based in Kotobuki, Taito-ku, Tokyo, that concentrated its output on tinplate vehicles but occassionally produced other metal toys as well. Mansei is not known to have produced toys after c1960. 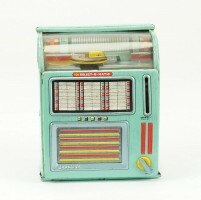 Tinplate saving bank dating to around the mid-1950′s, modelled as a ‘Select-O-Matic’ Jukebox. Multi-coloured detailed tinprinting but predominantly in light blue finish with transparent celluloid window to front. Clockwork in operation, when coin is deposited turntable rotates with 3-dimensional record (red raven label). Internal music box is operated by switch to rear, 12cm. high. Friction drive vehicle modelled as an American Ford Edsel Police Car. 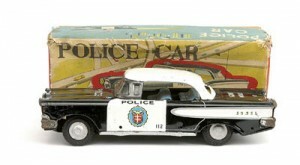 Model comes in typical police black and white bodywork finish with police badge decals to doors, plated parts with wrap-around bumpers and detailed tinprinted interior, 19cm. Friction driven 6-wheel vehicle comes in red bodywork finish to cab and back with black cab roof and black detailing to upper portion of back, 21cm. 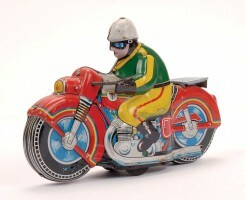 Tinplate friction driven model of a motorcycle and rider. Motorcycle comes in red and blue finish whilst the rider has yellow trousers, green jacket and white helmet. 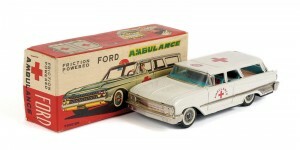 Haji friction drive Ford Ambulance, model is based on an American Ford Station Wagon of the 1960′s. Vehicle comes in white bodywork finish with typical red Ambulance markings, detailed tinprinted interior, plated parts with wrap-around bumpers and hub caps, 21cm. Battery operated (2 x ‘D’ cell) detailed tinprinted ‘dancing’ minstrel figure. Figure in green chequered jacket with orange striped trousers and yellow ‘straw’ hat. 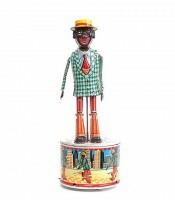 Detailed tinprinted base with figures of dancing Sam all around, 28cm high. 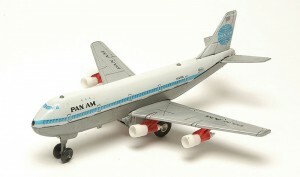 Battery operated model of a Jumbo Jet in the livery of Pan Am airlines. Tinplate upper and grey plastic lower fuselage with grey tinplate wings fitted with 4 x engines. Measures some 35cm. wingspan. 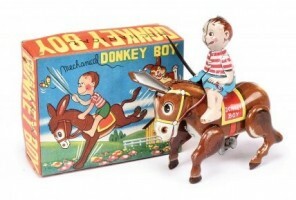 Haji Donkey Boy, a tinplate clockwork donkey with a mounted boy rider. Both the boy and donkey are tinprinted in colours. Clockwork mechanism fitted with permanent key. 9cm. in length. Marusan Shoten 1947 – 1968 / 1969 - present. Formed in Tokyo in 1947 Marusan was initially a wholeseller/reseller of mainly tinplate and optical toys. Its roots lay in an earlier company, Ishida Manufacturing, formed in 1923 by Naokichi Ishida, based in the Tawarachou region of Asakusa, Tokyo. Ishida again producing tinplate and optical items such as toy binoculars and telescopes. It was Ishida’s founders two sons along with a third party who were to set up Marusan. The company name and logo derive from the Japanese ‘Maru’ = Circle and ‘San’ = Three. In 1950 Marusan was formally incorporated as Marusan Shoten Ltd., ‘Shoten’ = Company. At this time the three founders, Haruyasu Ishida was listed as President, Minoru Ishida was the Managing Director and Yasuo Arai, Director. 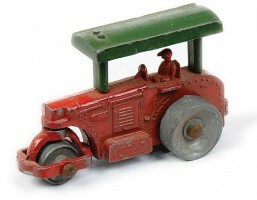 By 1951 Marusan was producing a range of both friction and mechanically driven tinplate toys some of which incorporated celluloid figures. The 1950′s was a very busy time for many of Japan’s toy companies including Marusan as the US, in particular, began importing more and more tinplate toys. 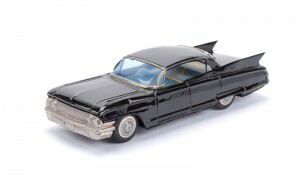 In 1953 Marusan introduced their now famous and successful tinplate model ’Cadillac’ and it is this vehicle in particular along with similar Marusan civilian model cars that are much sought after by collectors today. 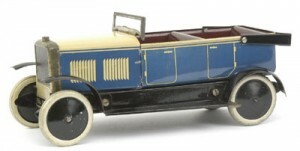 Several of Marusan’s elaborate tinplate vehicles, including the cadillac model, were actually sub-contracted to one of the top toy craftsmen of the time, Mr. Matsuzou Kosuge and his Kosuge factory, whos mark can be found on the boxes and model bases along with the SAN mark on such vehicles. 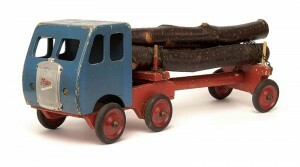 Apart from the usual range of tinplate civilian and military vehicles the 1950′s also saw Marusan release several battery operated toys based on a smoking theme with titles such as ‘Smoky Bear’, ‘Smoking Grandpa’ and ‘Smoking Bunny’ to name but three as well as a clockwork ‘Smoking Donkey’. Not very PC by todays standard ! 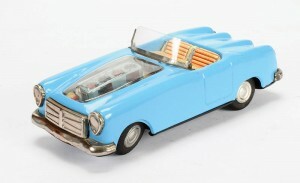 By the beginning of the 1960′s Marusan had already moved into plastic model kits a theme which was to continue and also ventured into die-cast miniature cars called ‘Toyo Ace’. However Marusan was unexpectedly declared bankrupt in 1968 a fact which was to lead eventually to the establishment of two companies. Marusan continued with a range of vinyl character toys and also began producing toys and parts for third parties in the 1970′s and 1980′s. Marusan is now one of the oldest names in the Japanese toy industry. It should be noted that in 2001 Marusan announced the release of a ‘Limited Issue’, highly detailed, tin toy Cadillac car made in the style of the 1950′s classic, all of which sold out ! 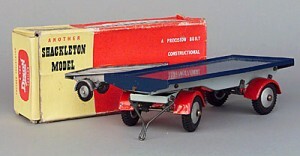 A 1959 Marusan friction driven, tinplate model of an American Cadillac. Vehicle comes in black bodywork finish with plated parts including wrap-around bumpers and wheel hubs. Detailed tinprinted interior, 24cm. Shown opposite is the vehicle released by Marusan in 2001. 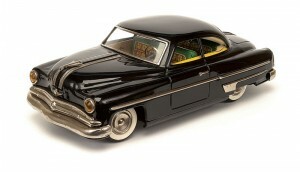 This ‘Limited Issue’, highly detailed tinplate model of an American Cadillac was based on the cars released in the 1950′s. 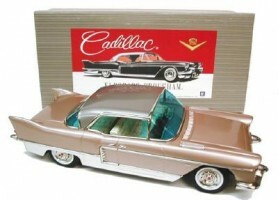 The model, based on the 4-door pillarless Cadillac Eldorado Brougham Sedan, was released in three authentic colours, the one shown plus one in black/white and one in blue/white. 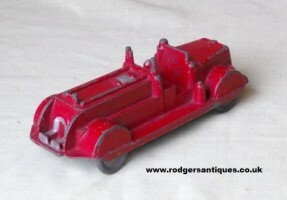 Battery operated toy, open topped car in red bodywork finish with plated parts including wheel hubs. Detailed tinprinted interior with tin driver figure smoking pipe. Fitted with ‘mystery action’ to underside, 24cm. Friction drive tinplate scooter with tin rider and schoolgirl passenger. Multi-coloured model, scooter predominantly in red and grey with ‘Silver Pigeon’ lettering to rear, fitted with clear windshield, 13cm. 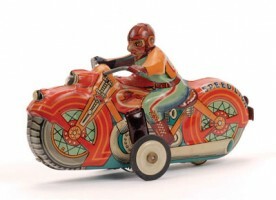 Marusan ‘Speed Lion’, friction driven tinplate motorcycle with rider. Multi-coloured, red, orange, blue and green with red plastic engine panels with sparks behind. Rider has racing number 18 to his back, 14cm. Pictured opposite is the Marusan Wonder MG Car, model is of tinplate construction with clockwork drive. Fitted with 2x tin figures and a revolving umberella. In operation the car crosses the bridge, turns around and repeats the operation. Colourful tinprinting, car predominantly in red colourway finish with plated parts. Car is 13cm, track is some 31cm. 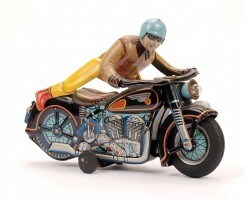 Formed in Tokyo sometime in the mid 1940′s Nomura Toys produced some excellent tin toys until the early – mid 1970′s when, like many other japanese toy companies, it had to make the move into diecast in order to survive. Nomura continued in one form or another until it was bought in 1992 by the largest toy company in the world at that time - Hasbro. The letters T-N within the diamond logo means that the company is often referred to as TN – Toys Nomura and its range of tinplate toys were to emblazen this logo on its boxes whilst its later diecasts toys simply featured ‘Nomura toy’ on their boxes. 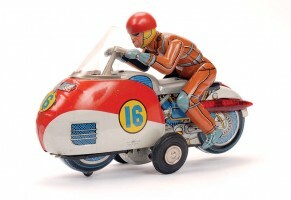 It was one of the biggest and most prolific of the post war Japanese tinplate toy makers and produced a wide variety of mechanical and battery (Electromobile) operated toys, military and civilian vehicles, novelty items and space toys. 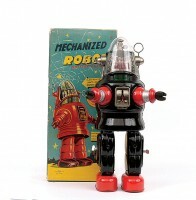 During the 1950′s and 1960′s the tin toy output from Nomura contained some of the most well known characters of all time including the infamous ‘Robby’ robot from the film ‘Forbidden Planet’. 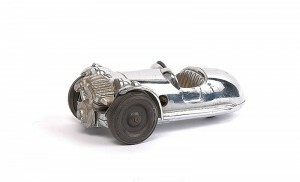 Nomura battery operated tinplate open topped sports car. Scarce example c1950 comes in powder blue bodywork finish, plated parts including hubs with detailed tinprinted interior. See-through engine compartment to bonnet and fitted with folding windscreen, 21cm. A Nomura battery operated Mercedes Benz, tinplate model in orange colorway finish with black hardtop. Tinprinted detailed interior, plated parts with side detailing and hub caps. Battery compartment and ‘mystery action’ to underside, 27cm. Battery operated model with forward and direction changing motion. Red and white bodywork finish, racing number ’16′, detailed tinprinting overall. Rider in tan coveralls with red plastic helmet. Stabilising wheels, 25cm. Nomura c1961 large scale tinplate friction drive Fire Chief’s Car. 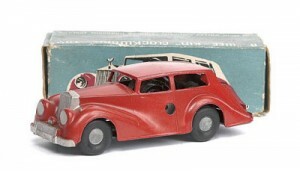 Model is based on a Buick 4-door sedan in fire department red bodywork finish, detailed tinprinted interior, plated parts including hub caps. and side detailing including Fire Department insignia. Operating / swivelling red roof light, wiper blades and siren, 41cm. 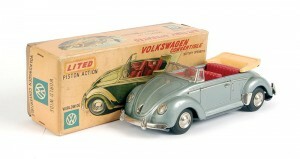 Battery operated Volkswagen Convertible, tinplate model in light metallic blue bodywork finish. Clear plastic see-through engine cover to rear, plated parts to include hub caps. Detailed interior with plastic seats and hood,steering wheel, windscreen, 25cm. Another large scale model is this battery operated tinplate Datsun Cedric H130 c1960. 4-Door saloon in red bodywork finish, detailed tinprinted interior, plated parts including hub caps, 39cm. Large scale battery operated Police Command Car c1960. Vehicle in black and white bodywork finish with badges to doors and ‘Highway Patrol’ lettering to sides. Detailed tinprinted interior with two uniformed police figures to front, aeriel, plated parts including hub caps. Fitted with siren sound and ‘mystery action’ to underside, 39cm. Although the wording on the box simply lists this toy as a ‘Mechanised Robot’ it goes without saying that it is based on ‘Robby’ the robot which features in the 1956 movie ‘Forbidden Planet’ and as such is an unlicensed product. Battery operated, batteries are stored within the legs of the robot, c1957. Tinplate and plastic construction, finished in black and red. Spinning antennae, lighted moving piston action in head, light below dome, 28cm.